Learn to Play, Love to Play – Star City Games In-Store Programs Homepage! When I asked what the secret to his growth was, he responded with, “Be the customer’s friend! As customers walk into my stores, I do not push for a sale, but instead I have my staff introduce themselves, shake the customer’s hand, and simply be the customer’s friend. The sales come naturally. It can be difficult to walk into a new store for the first time. Our staff learns your name and every single customer is greeted not because we have to, but because we are genuinely glad to see them. 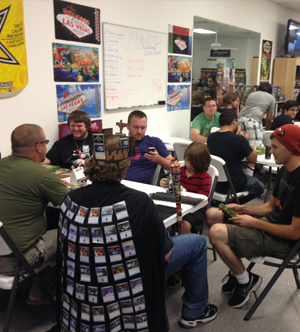 The L2P culture keeps customers driving past 3-4 other stores and spending more than an hour drive each way just to be a part of our community.” He added that it helps that they run more StarCityGames.com Invitational Qualifiers than any other store in the area. Be the customer’s friend! As customers walk into my stores, I do not push for a sale, but instead I have my staff introduce themselves, shake the customer’s hand, and simply be the customer’s friend. The sales come naturally. Check out Todd’s Facebook Page to learn more! If you would like your store to be featured in this column, send an email explaining why to storespotlight@starcitygames.com. If your store is in the Store Spotlight, we will also send you a coupon for a FREE Swag Pack for one of your events! Advertising The 2014 Spring Season is Here!